Whenever legendary actors appear in something nowadays that’s considered beneath their talents or only because they’re now older, like Robert De Niro in Dirty Grandpa or Al Pacino in Jack and Jill, it creates concern from fans about whether anyone in the film business nowadays knows exactly what to do with these talents. So when something like Going in Style comes along, which features not one but three legendary actors working alongside each other, and the main joke of the film is that they’re old, you’d expect it to fall right in the ranks of those other lesser films. But luckily, Going in Style keeps its head above water for just long enough to be fairly entertaining fluff that’s completely harmless to anyone that comes across it. A remake of the George Burns-starring film of the same name, the plot sees a trio of elderly gentlemen – Michael Caine’s Joe, Morgan Freeman’s Willie, and Alan Arkin’s Albert – learning that not only are their pension funds being frozen as a result of their company’s new merger, but that the bank which is threatening foreclosure on Joe’s house is overseeing the transition, effectively using their pensions for utility bills. Angered by their treatment, they decide to rob the bank and take what is rightfully theirs, which may be trickier than they think because none of them have real experience with professional crime, and also they’re rather old. It is a heist movie in the traditional sense, one that feels like a throwback to the classics instead of a fully-modernised rendition complete with commentary about the broken financial system of today. Instead of all that, you have a film about a bunch of guys who get screwed around badly and decide to do something about it, but its heart is always in the right place and never allows the film to become too cruel or even that disingenuous. Caine, Freeman and Arkin have great screen presence together, whether they’re learning the tricks of the trade or sitting around watching episodes of The Bachelor, and individually they’re great at bringing the likability to their characters that make you really want to root for them throughout. They collectively carry the film on their shoulders, and provide enough heart and genuine warmth to the story to make you invested all the way through. The ride is a fun, if mild, one with some decent laughs sprinkled throughout the film, even though not many of them are truly worthy of belly-laughs. A “practice run” in a convenience store earns a good few chuckles, if only for the sight of Morgan Freeman riding in the basket of a mobility scooter alone, and of course the banter between the lead actors is always a delight to listen to, but don’t go in expecting a fully laugh-out-loud comedy, as although you’ll definitely get some good laughs every now and then it’s more of an amusing time-waster than a laugh riot. The film is directed by Zach Braff, of all people, and thankfully he plays things more mainstream here without the urge to make it artsy every once in a while, but luckily he also knows how to entertain an audience (after all, why do you think Scrubs lasted as long as it did?) and has such respect for the actors he’s working with that he gives them enough focus to get the best out of them, even for something as mild as this. The film loses a little bit of steam after the central heist actually takes place, with characters making certain decisions that are a little questionable in the grander scheme of things, as well as a late reveal which doesn’t feel entirely necessary to the plot as a whole. Actors like Matt Dillon as the FBI agent trying to find the culprits, Christopher Lloyd as a senile club leader, and Peter Serafinowicz as the deadbeat pot-dealing father of Caine’s granddaughter, don’t get that much to do next to the three leads, and even at just over 90 minutes there are parts that feel like just the slightest of padding. But even so, it all adds up to something fairly satisfying in the end, because you’re with these main characters all the way through, and it has its heart in just the right place to make you feel warm inside when it reaches the ending that it has. It’s a fine little treat for anyone who just wants to see the likes of Michael Caine, Morgan Freeman et al doing what they do best. 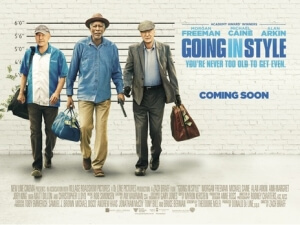 Going in Style is a mild but likeable and entertaining heist flick that rests firmly on the strong chemistry between Michael Caine, Morgan Freeman and Alan Arkin, and has its heart in the right place which makes you want to root for these characters all the way through and not let anything bad – or worse than the inciting incident – happen to them.